Chosin Chibana was a native of Torihori village, Shuri. After being turned away twice, he started karate training with Anko Itosu at the age of 15. Chibana stayed with Itosu, his only instructor, for 13 years. At the age of 34, Chibana opened a dojo in Torihori and taught Itosu's karate as it was taught to him by Itosu. Chibana named Itosu's karate Shorin-ryu in 1935, adopting the Chinese characters that literally mean "small wood" (these characters may also be pronounced Kobayashi). 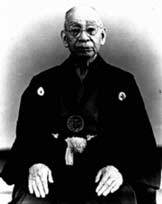 Chosin Chibana is credited with creating the Kihon (basic) katas (Kihon Kata 1, Kihon Kata 2, Kihon Kata 3, Kihon Kata 4, Kihon Kata 5) used in Shorin-ryu as the first katas taught to students.